Ben Steelman, currently works as a features writer, book and movie reviewer and MyReporter.com contributor writes, "Wilmington author turns to fiction"
"Wilmington-based philosopher Tom V. Morris has spent decades laboring to make philosophy accessible, and even useful, to the average person, in best-selling volumes such as "If Aristotle Ran General Motors," "If Harry Potter Ran General Electric" and, yes, "Philosophy for Dummies."" What wisdom can equip us best for the journey of life? 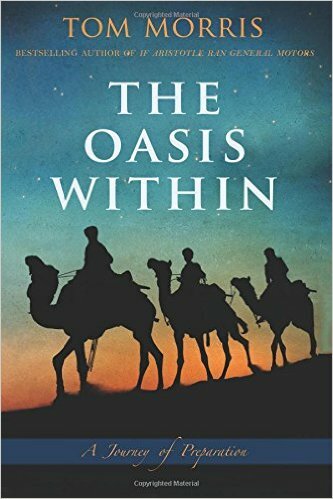 In "The Oasis Within," Morris turns to fiction, but he doesn't stray far from its roots. 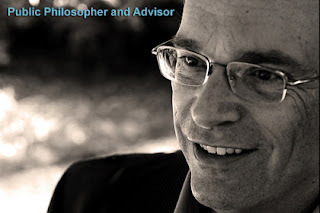 At its heart, his novel is a philosophical dialogue -- a recognizable descendant of similar works by Plato, Jean-Jacques Rousseau ("Emile") and George Santayana ("The Last Puritan"). In 1934, a caravan is crossing the Egyptian desert, bound for Cairo. One of the travelers is Ali, by all appearances a veteran trader from a small village. Along the way, around the campfire or at slow points on the trail, Ali tries to tutor the boy on the skills he'll need in life -- not just things like watching for grooves in the sand to beware of vipers or crouching low by your camel, mouth covered, to ride out a sudden sandstorm. Instead, he talks about how to keep a perspective on one's problems, how to maintain an emotional and intellectual balance, how to expect change and how to cope with it, how to set goals, then build toward them. 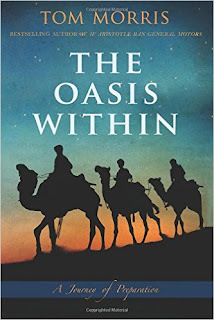 Among the first skills Ali teaches is how to find an oasis within oneself: a calm place, where one can think and find rest and solace in the hard times of life.